In Savages, Don Winslow introduced Ben and Chon, twenty-something best friends who risk everything to save the girl they both love, O. Among the most celebrated literary thrillers, Savages was a Top 10 Book of the Year selection by Janet Maslin in The New York Times and Stephen King in Entertainment Weekly. Now, in this high-octane prequel to Savages, Winslow reaches back in time to tell the story of how Ben, Chon, and O became the people they are. 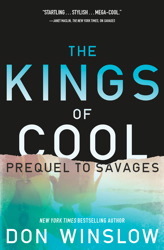 Spanning from 1960s Southern California to the recent past, The Kings of Cool is a breathtak­ingly original saga of family in all its forms—fathers and sons, mothers and daughters, friends and lovers. As the trio at the center of the book does battle with a cabal of drug dealers and crooked cops, they come to learn that their future is inextricably linked with their parents’ history. A series of breakneck twists and turns puts the two generations on a collision course, culminating in a stunning showdown that will force Ben, Chon, and O to choose between their real families and their loyalty to one another.